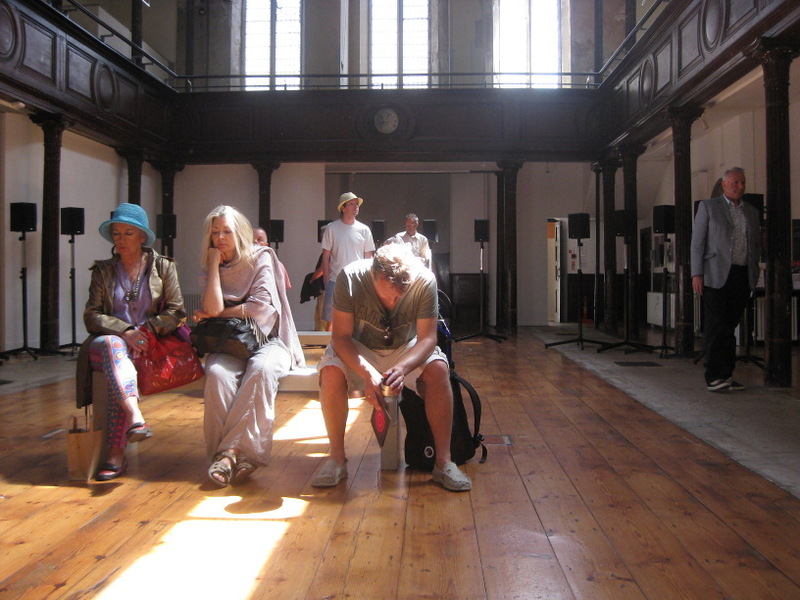 When a gallery is a deconsecrated church and the artwork is a piece of religious music, walking in is a hair’s breadth from turning up for Sunday worship. It’s humbling, even humiliating. The early choral work, Spem in Alium by Thomas Tallis, is drawing people in off the street, nevertheless. This is one church that’s full. The only people lacking are clergy and choristers. Instead 40 state of the art speakers surround the ad hoc congregation. They are placed at person height and a different voice from Salisbury Cathedral Choir can be heard on each. Were this a live performance, it would feel even less like art. Empassioned song fills the gallery, but the singers are absent. Their lack of presence is the most engaging aspect of the piece. The choir is an effect of technology so perhaps God is just an effect of such choirs. He and they are both here and not here. It depends whether or not you close your eyes. But the voices are in layers, so there is something fathomless about that question. And the several parts of the composition can surprise you. Phrases come at you from different angles. Cardiff has said she wants this to work to explore the ways in which sound can structure a space. It can certainly dominate a place and resonate with a building’s original function. So, walking in is strange. And as notes here point out, the experience is intimate. We are, one supposes, naked under the eyes of God. Hence a bit of embarrassment. There’s little choice but to join the flock and accept the embrace of this work. But getting out of church is still a relief. Weddings, funerals, ecclesiastical art shows, you name it. There are plenty more voices offering counterpoint to this. Classical music blog An Overgrown Path has specced out the audio equipment. Todd Gibson on From the Floor found it emotional. Dugal McKinnon’s blog, meanwhile, offers a compelling analysis which spells out the transcendental qualities of the work and goes much further on the theme of presence and absence. The current show at Fabrica runs until 30 May 2011. See website for more details.